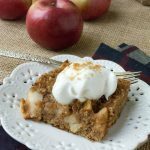 Low Carb Grain Free Apple Dump Cake is a simple recipe that is grain free, gluten free and made with no added sugar! We’ve had a rough week in my house. Not a bad week in that sense, but a pretty tough one nonetheless. Moving out of one house a few days before you can move into another is difficult with 3 kids and a dog. The excitment of moving kept my family in good spirits. We moved out of the hustle and bustle of a small crowded city neighborhood, to a quiet country setting in the woods about 30 minutes away. Something we’ve always wanted. It’s fitting for me to post an apple recipe being that we have a beautiful apple tree in our new, very large yard. Something we’ve always wanted for our kids. Furniture just arrived, but with it all the boxes that make a move challenging, the unpacking of it all. 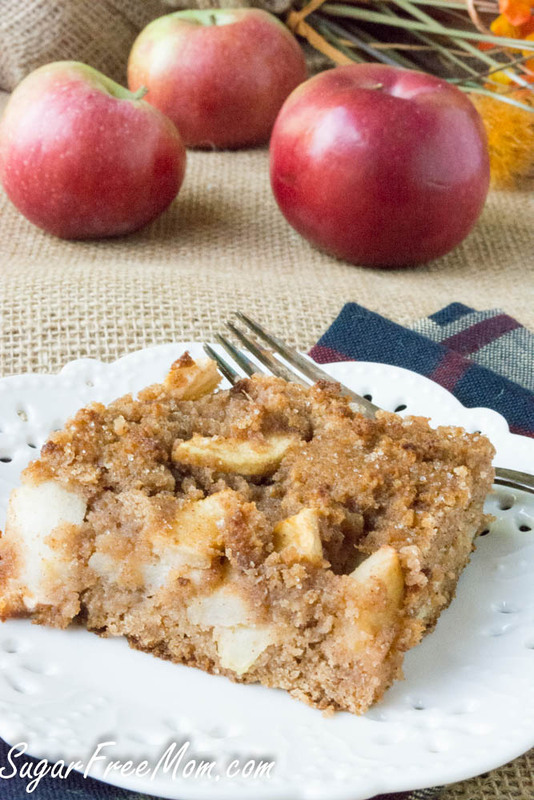 This apple dump cake makes me happy and peaceful just looking at it. It reminds me that life can be simple, just like simple recipes, and it’s ok. Because as long as you have your family and some essentials you can do anything. 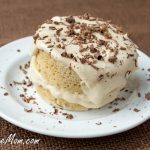 While it might not be the prettiest of cakes, topped with a little whipped cream, you’ve got comfort on a plate. No need for fancy anything at this country home we are in, just as this cake needs nothing fancy to make it specatuclar. 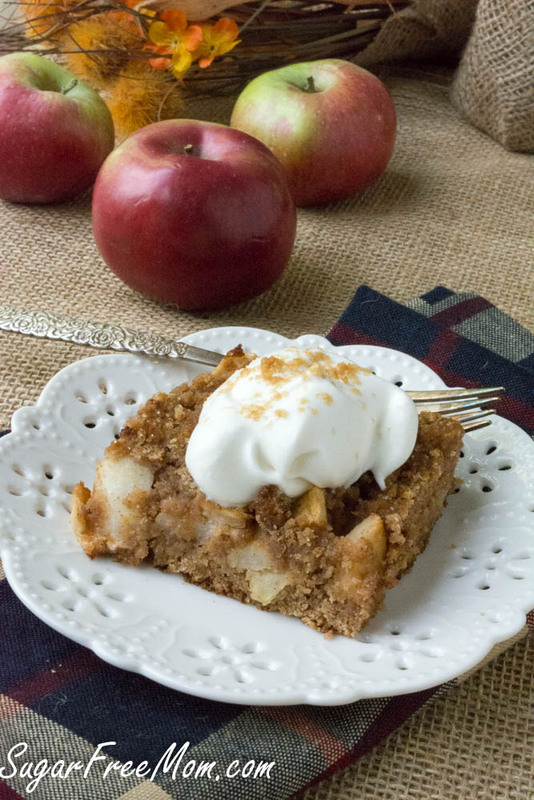 This apple dump cake is a reminder that the simple things in life are always the best. To make life easier we bought an apple, corer, peeler tool and it worked fabulous and it was fast! If you don’t have Swerve you can use another sugar free sweetener but most are much sweeter than Swerve so I would suggest reducing the amount to 1/2 cup. If you don’t have cinnamon stevia, use plain or vanilla. In a large bowl whisk the flour, Swerve, cinnamon and baking soda together. Whisk in eggs, butter and stevia until combined. Stir in the apple slices until coated. Spread mixture into a greased 9 by 13 baking dish. 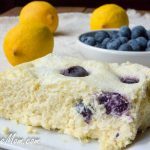 Enjoy with some sugar free whipped cream! Is there another flour you could recommend? Almond? Lentil? One family member cannot tolerate coconut flour.. Thank you. Love your recipes. My youngest has a tree nut allergy, but I would try almond as well if I could. Made this to go with my New Years dinner. 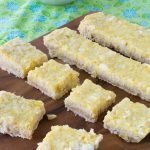 Delicious and easy ! Made fresh whipped cream, which totally made this dessert ! So glad you liked it thank you for coming back to tell me! CONGRATULATIONS on your move to the country. Hope you all enjoy living there. I like your idea. 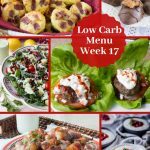 Especially good low carb information. A little smile for the definitive. The old British cooks’ definition of “stodgy” means filling, heavy, lots of carbohydrates. Hope you enjoy all things new. Enjoy your new digs! How wonderful to be moving someplace you have wanted to be. As for this cake — this is on my “must try” list, as I come up with an arsenal of desserts to keep us away from the sugar-and-grain parade of holiday foods. Thank you! 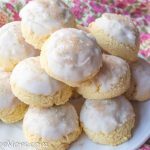 This is such a tasty and comforting dessert that will probably taste even better in your new country kitchen! Congratulations on your family’s BIG move! 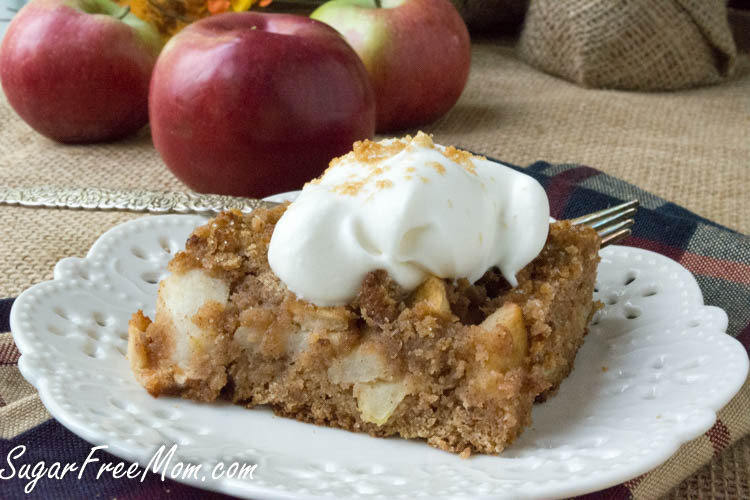 Can’t wait to try this recipe especially with holidays coming and fall being in the air. 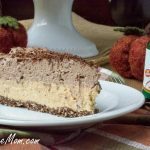 Do you happen to have a discount code for iherb.com ?? Also which of the Sweetleaf sweeteners would you suggest are good starters to buy first? Thank you! My discount code is YAJ035. I would choose vanilla creme, clear and the hazelnut is fabulous in coffee! You use the different flavored Stevias in your recipes, but I find them to expensive to use/buy. What would be an alternative to them? 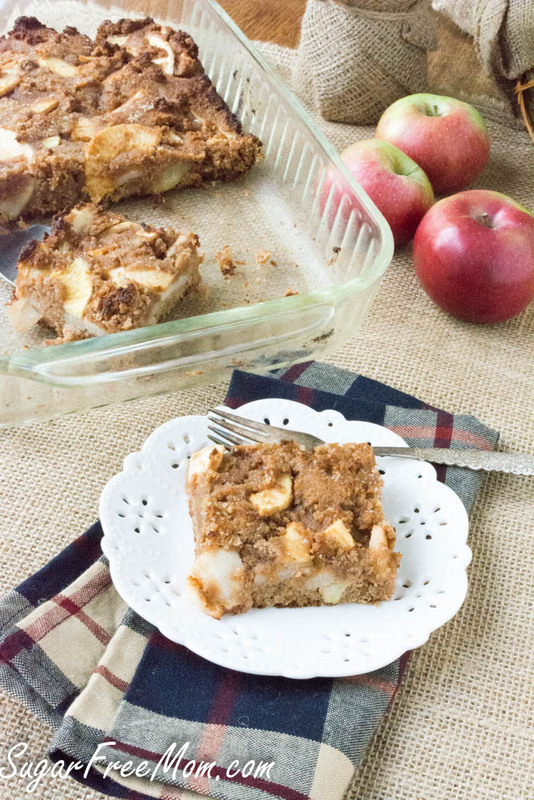 Would the dried spice of say cinnamon work in place of the liquid stevia called for in this Apple Cake recipe? Unfortunately, cinnamon alone is not equal to the sweetness that stevia has. You could just buy the vanilla creme stevia or clear and use it in most of the recipes I have. My discount code at iherb.com is YAJ035 if that helps, i find it cheaper to buy online rather than stores. Blessings to you and your family as you begin to make special memories in your new home! I haven’t tried that but I would say yes, should be fine. Yes use YAJ0435 for a discount. What kind of coconut flour did you use, what brand? Ours wasn’t dry at all. I also just got finished with making this. A total disappointment!!!. Was very dry and did not hold together at all when trying to cut a piece. Waste of ingredients!!!! Very good cake. I food processed my apples a little too much but I think the extra juices made for a moister cake. I don’t always have luck baking with coconut flour. . I also added some vanilla and Carmel extract and it taste like Carmel apples. Taste good even though I messed it up a bit, can’t wait to taste when I do it right! ! I just made this, but I made it in muffin pans for portion control. I also used brown sugar sub and added dried unsweetened cranberries. Got 19 muffins for 8 carbs a piece. So good. Liked the taste of the cake but mine turned out dry as well. I’m wondering what brand of coconut flour you used since yours wasn’t dry? 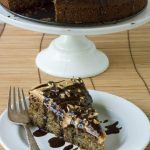 Could almond flour be substituted? Would other ingredients need to be adjusted as well? Thanks for your advice. Mine is in the oven. I am excited to taste it! It was so easy so follow the step by step recipe. I made this last night and it was extremely dry. Everything I make with coconut flour is dry. I use Bob’s Red Mill coconut flour. I am allergic to almonds & almond flour though, so it’s hard to find substitutes. 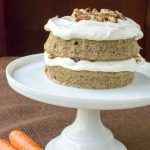 Any substitute for cinnamon liquid stevia? I dont have any and would love to make this! I tried to make this for Rosh Hashanah dessert. It was so dry I choked. Is there anyway to make this moister, because I had to dump this RIGHT in the trash ? Maybe it baked a bit longer in your oven than it needed. You could also swap the coconut flour for almond. Coconut can tend to be drier than other wheat free products. If you swap almond flour for the coconut, would you still use 1 cup? What would your adjustment be? Thanks much! I would use 1.25 cups of almond. I agree with those above. This cake is EXTREMELY dry. ( I even had some extra apples in there.) It really needs more moisture. I kept double checking ingredients to make sure I hadn’t accidentally omitted a liquid somewhere. I saved it with a caramel sauce, otherwise this just didn’t work. This is the second time I’ve made this and I like it~ a lot. To those who are saying it’s dry, it’s not like a batter based cake mix…it’s more like a drop dough/ fruit cobbler. The first time I let it cool, cut it into 24 bars and stored it in the fridge. It was moist and still delicious a week later! This time I added about 3/4 cup of fresh applesauce and it loosened up the batter quite a bit. I let it bake for about 40 min and it’s cooling now. It feels much softer than the first. We shall see when I have some for breakfast with a nice cup of coffee~ yum! Is serving size really 1g ? There was a glitch with my recipe plug in. There are 12 servings in this cake. Thanks, I was wondering the same thing! I modified this to be 1/2 C each almond and coconut flour, added 1/2 C applesauce and about 1/4 olive oil. Was perfect. Couldn’t keep my husband out of it. 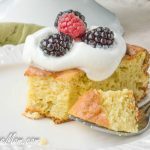 Would this recipe work with blackberries or another berry? This looks really great!! Could you substitute zucchini for the apple to cut the carbs further? I think that’s what they use in “mock apple pie”. I can’t have any artificial sweeteners. 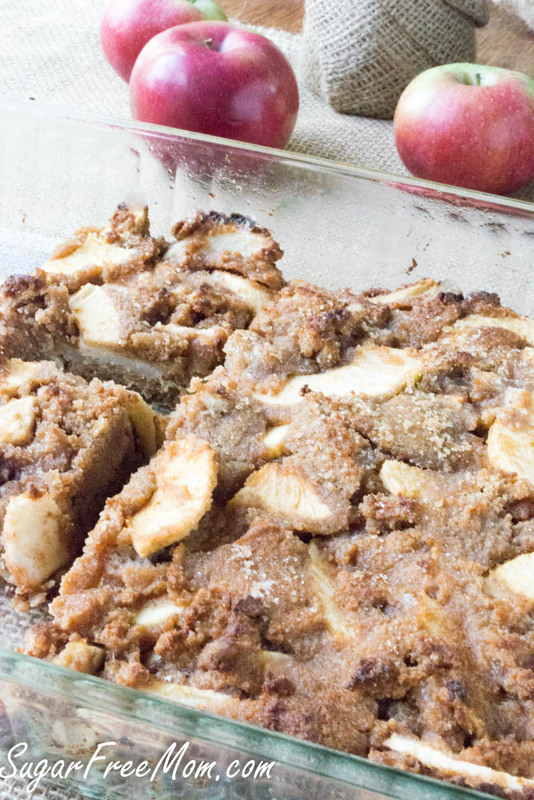 What can I add to give this a touch more sweetness than what the apples add and still keep it low carb? Stevia isn’t artificial. Swerve isn’t artificial either. Both are low carb sweeteners that are natural and don’t spike blood sugar. I used xylitol & half the amount as I don’t have a sweet tooth with the sweetness of the apple this was perfect for me. I added English toffee stevia drops. Turned out darker than photo & moist , quick & easy to make. I will definitely be making again. Many thanks. Great recipe, thank you very much! So based on the comments about the dryness, I used half the amount of coconut flour and it turned out great! I’ve been doing keto-ish for almost 2 years now as a T2 diabetes control. I was a very good cook/ baker before but never realized the magic of wheat flour until I couldn’t use it! 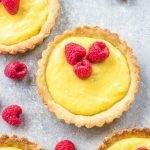 I’ve got a small handful of ‘keeper’ keto recipes that don’t taste like a cold omelette, have FLAVOUR (man what is up with getting almond flour to taste like anything!? ), and contain ingredients I now stock in my new keto pantry. Your cake made it into my little book! I cut it in half in a 9×9 glass pan. No stevia liquid so I added an extra 1.5 tsp sweetener, kept the cinnamon at 2tsp and added 1/4 tsp nutmeg. 25min then cover in foil and another 20min. I think people saying it’s dry probably have hot ovens and / or don’t understand baking in the first place. If it’s browning but not cooked COVER IT! Don’t just leave it until it’s rock hard. It’s practically impossible to be dry when it’s more than 50% apples! Thanks for the recipe.